The bending operator has always depended on guesswork to calculate bend options from a part and orthographic drawings. Entering tool selection, bend sequence a part, staging layouts and other processes steal valuable operation hours, and incorrect setups may require restarting from scratch. This results in an 80% set-up time with 20% left for processing parts. VPSS3i Bend is your Automated Bending Expert, interpreting unfold data for bend simulation and set-up generation. There is no tool more useful for reducing bend set-up time. VPSS3i BEND maximizes bending productivity and efficiency by automatically generating offline press brake programs, verifying the part feasibility and generating common tool setups to bend multiple parts. 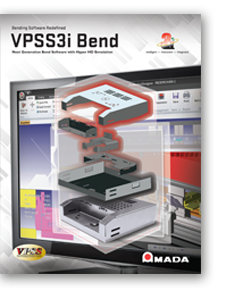 Every aspect of VPSS3i Bend has been enhanced to offer more functionality than ever before. Accurately rendered by a new simulation engine, VPSS3i Bend’s enhanced collision check now supports forming and hardware inserts for visual collision checks.